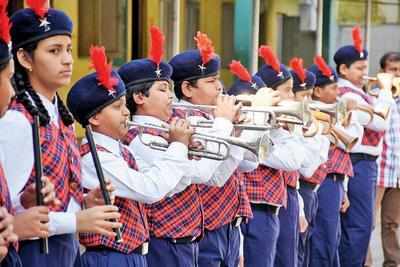 Vadodara: Thousands of students received a grand welcome as board exams for class X and class XII under the Gujarat Secondary and Higher Secondary Education Board (GSHSEB) started on Wednesday. A total of 68,393 students of class X and class XII appeared for the exams in Vadodara district. Voluntary groups, school managements and district authorities welcomed the students by offering them roses and chocolates at the exam centres even. While 45,191 class 10 students appeared for their first language paper (English, Gujarati, Sanskrit), 15,042 students of class 12 general stream appeared for the accounts paper. Similarly, 7,538 students of class 12 science stream took their physics exam. Nineteen prisoners of Vadodara jail also appeared for the exams. While nine of them appeared for SSC exam, ten others appeared for HSc exam.